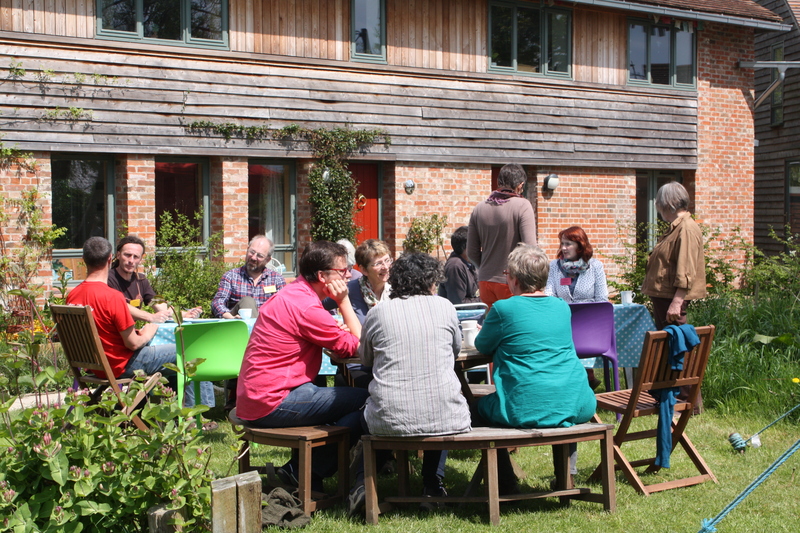 Libby and I went down to the Threshold Centre in Dorset, the weekend of May 17, for the annual conference and AGM of the UK Cohousing Network. About 40 of us, from existing and forming groups all over the country, participated in a really inspirational workshop run by Diana Leafe Christian, a groups expert from Colorado. One of the best features of a very nice weekend was the warmth and hospitality shown us all by the Threshold community, some of whom vacated their beds or made spare rooms available for those, like me, who felt too old to sleep in tents or the yurt or in the attics. Their cooking team, headed by a guy named Michael, produced the most wondrous meals – even a full cooked breakfast each morning, for which Michael got up at 4.am. Our welcome at Threshold set the tone for friendly, easy discussions, and it was fun to compare notes with so many cohousers. Diana went on from the conference to run workshops for the Lancaster and the Community Project groups. Next time the Network gets someone like her, I hope Cohousing Woodside will be ready to arrange a workshop for its members too. At the UKCN AGM, the ‘old’ directors – those who founded the Network – gracefully made way for the new directors, for the first time elected from the Network’s group members and individual members. Mark Westlake (Lancaster) returned to the Board as chair, I returned as a director (Cohousing Woodside) as well as Amanda Pearson (Threshold). Others were elected as individuals rather than as representatives of a group. The UKCN Charity will shortly be registered, we hope, and directors of this are Melanie Nock (Community Project), John Goodman (Co-op movement) and me.